There have not been many opportunities for me to post on the blog. I’m back in the nation’s capital for a special assignment, and it’s taking more of my time than I had originally planned. Still, I wanted to thank you (yes, you) for reading this year. Here’s hoping that 2016 brings with it new opportunities for us to continue to spread the Good News about science, evidence, reason, and all those good things that moves us forward as a species. And here’s also hoping that the anti-vaccine activists, militants, and their minions come around to join us in the light. If they don’t, it’s not because we didn’t try. Well, well, well. It seems that this old blog got some sort of an enormous boost over the last 48 hours. As a result, I want to take a moment and welcome all the new readers. Now, most of you are here because you are interested in my blog post about one Dr. Peter Doshi, PhD. However, if you look around the blog, you’ll see that I cover a whole range of other issues, 99% of them having to do with science denialism and its consequences. The other 1% is just me on a rant. There is something for everyone here, from abortion to male circumcision to one of our favorite subjects: vaccines. 250 posts later, and this is where we are? A couple of posts ago, I wrote about how a (probably) anti-vaccine activist called the DC Department of Health and complained that someone was impersonating an epidemiologist. In case said person is reading, nothing happened. I am an epidemiologist. Several of us write blogs. It’s a fact of live that we’re going to refute your lies and misinformation. Live with it. That said, I’ve been applying to several jobs over the last few months. I don’t have a lot to tie me to the capital area, except my friends. I love my friends, some of them more than others. But it is time for a change, and that time is coming up soon. I’ve lined up several interviews from here in town to up in Baltimore, to all the way up in New York City. (NEW YORK CITY?!) Some of those job leads are very promising, and I’d be doing work overseas. Of course, the anti-vaccine crowd is going to say that this is a direct result of them calling DC DOH and complaining. They’ve always been very bad about association and causation, so why would this be any different? I hope it doesn’t all fall on deaf ears. 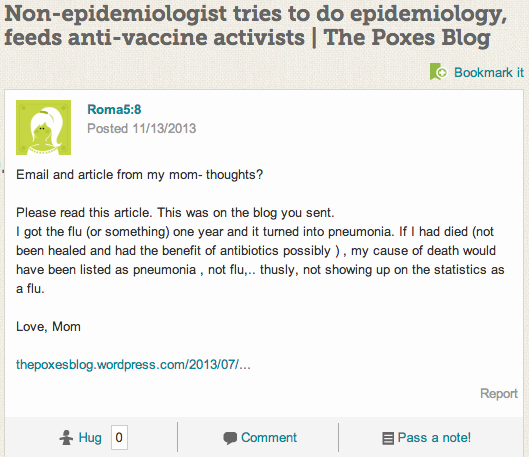 So, as you can see, dear anti-vaccine advocates, I’m not going away any time soon. I will continue to counter the lies and misinformation that your side continuously spews for whatever messed-up reason. I may change jobs, but my work will remain the same. I’ll let you know what happens, and when I start the new job. A close friend of the blog has been accepted into a doctoral program at an institution of higher learning on the east coast. I’d like to give you all the details, but there are lurkers about who would like nothing more than to bother or bully him about it. If you know who I’m talking about, then you’ll know where to find him and congratulate him. That’s all. Carry on. Nothing else to see here, for now.